ENTRIES WILL BE ACCEPTED ONLY IN CLASSES LISTED. Entries positively close at 5 PM, Saturday, September 15, 2018. Entries in this division will be accepted between 5 PM and 9 PM, Thursday, September 20, 2018, and must remain in place until closing, Sunday, September 23, 2018. The tent will close at 6:00 P.M.
Exhibits will be available after 7:00 P.M. Entries not picked up by 8PM become property of the fair. No prepared mixes may be used in this department. Entries requiring refrigeration cannot be accepted. All candy and cookies should be on plain white paper plates. Cakes accepted only on plain white paper plates or foil-covered cardboard, cut no larger than 1” over entry size otherwise entry will be disqualified. 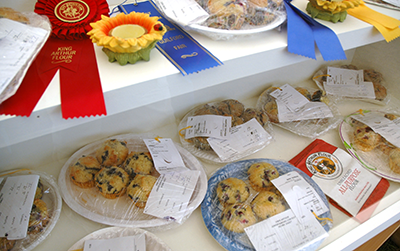 Where there is no competition, entries will be judged according to quality.